DCFS is a government agency with many various locations throughout Utah. This includes counties such as: Box Elder, Cache, Rich, Weber, Morgan, Davis, Tooele, Salt Lake, Summit, Daggett, Utah, Wasatch, Duchesne, Uintah, Juab, Carbon, Sanpete, Millard, Sevier, Emery, Grand, Beaver, Piute, Wayne, Grand, Iron, Garfield, San Juan, Washington, and Kane County. This government agency, particularly the location in Orem, Utah, needed more space for more boxes due to an increase of government documentation. These boxes contained government files and similar documents for record purposes. Archival shelving, also known as bolt-less shelving, with particle board decks, met the requirements of this government agency to store boxes of government documentation within the existing building. The Feature: Condensed storage for high volume shelving designed for storage of government documentation and similar records. The Advantage: Compact shelving, particularly for government documentation, allows for the most storage in a radius for each square foot of floor space. The Benefit: Having sufficient storage in one place for huge and growing documentation for government matters, rather than having to go to more than one location. Return on Investment: Costs can be cut down significantly within a budget, because of shelving for government documentation. Jaken shelving for government documenation is built to hold very heavy boxes that contain records. 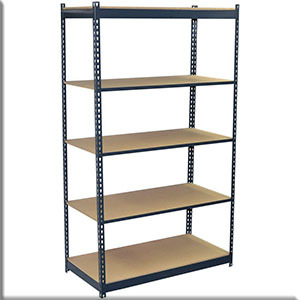 This boltless storage shelving utilizes a maximized shelf capacity and provides a quick and easy assembly, without compromising stability. 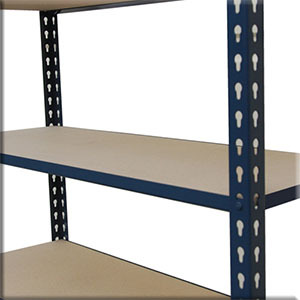 Heavy duty boltless shelving allows access to file boxes from either side of the unit. Shelves are also adjustable in height, in order to adapt to different sizes of boxes.